Knights Taxis are based in Alnmouth, Alnwick and Amble Northumberland. 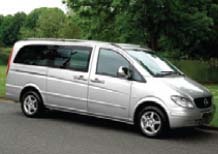 We have two 7 seater mini buses with wheelchair access, a Mercendes Benz Limo for weddings and special occasions. We carry out airport runs to Newcastle International, local and long distance taxi's, contracts welcome. We are ideally situated for pickups at Alnmouth railway station, so if you are visiting Alnwick Gardens or other parts of Northumberland via train, please give us a call. Sightseeing tours, golf packages ( stay & play) can all be arranged. We are currently taking bookings for Christmas and New Year. Our diary is filling up fast so please book early.